The main raw material base is high quality wood, available in multiple finishes and possibilities of compositions, consistent with meeting individual needs. The main attraction for those seeking timeless, warm and elegant atmospheres. Contrada is a model that brings you an exciting journey over kitchen world, where the warm essence of wood in walnut and white decapé colors are together to create a flexible and allure kitchen model and you can appreciate the careful beauty and quality of materials. CONTRADA is endowed with a perfect join of past and present, with dinamysm of a young staging. Ducale is daughter of Nature and Time. Its shapes are rich due to decorations, curved lines and ceramic handles. It has traditional elements but beyond its classic front it is hidden a modern and functional backbone. 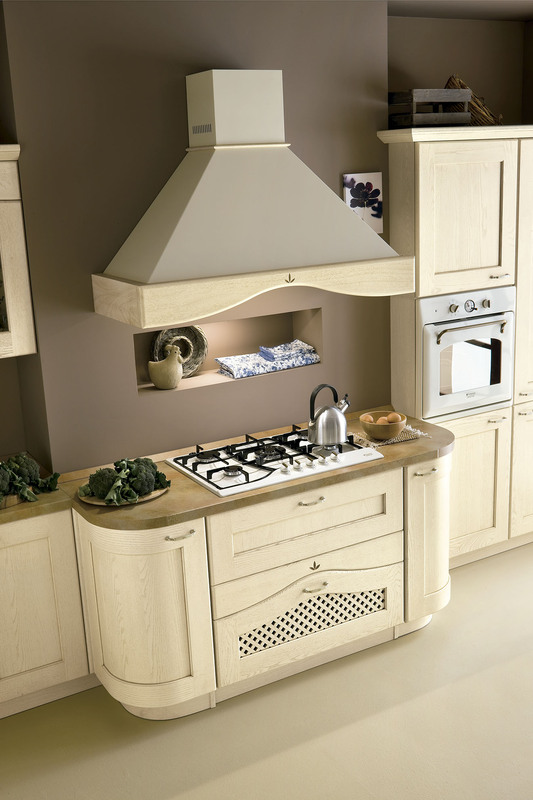 Ducale is shown in two finishes: cherry wood and ivory decapé. It has latest ergonomics solutions as full extraction drawers, islands and peninsulas. You can join little elements with large capacity cabinets. The exquisite decoration of carving represents traditional crafts establishing a friendly ambient, as result of the experience.